A turnbuckle is a 3-piece metal coupling device, specially designed to alter the applied tension slowly without spinning the cable/rope to which it is attached. This kind of fastener is enabled with an elongated or rectangular body and features screw holes threaded at opposite ends at the two-threaded inserts. The threaded regions of the turnbuckle either feature a hook or screw-eye at the non-threaded end. When these inserts are threaded into the device and the buckle is rotated, the screws eject out of the body, thereby releasing tension. And when it is turned in anti-clockwise direction, the screws on the other hand are driven towards the center, thereby increasing tension. Turnbuckles are usually comprised of internal screw threads along-with a long sleeve at both ends, so that they can be pulled together or pushed farther apart by twisting the central nut. The eye turnbuckles are also known as bottle screws and are used to fasten wires, cables, ropes, or shafts, which are either attached to an anchor point or to other cables, including ropes and shafts. These types of rivets feature a circular and enclosed connector on one or either sides. This circular part is known as eye and eye, hook and eye or jaw and eye. The eye portion of the buckle is made up of a shaft, featuring an eye outside and a threaded shaft inside, which blends with the turnbuckle’s central nut. The eye shape of this rivet is ideal for those devices, whose anchor point is enabled with a flexible shaft that can be secured into the eye. It is preferable at areas, where there is a possibility of the anchor point to slip out of an open hook. These types of fasteners feature a hook at both the ends and are known as hook and hook, hook and jaw or hook and eye. The hook portion comprises of a shaft along-with an open hook on the outer end and a threaded shaft on the inner part, which blends with the turnbuckle’s central nut. The hook shape is is ideal for those areas, where there is easy and quick attachment and where the anchor point does not merely slip out the opening of the hook. These types of turnbuckles are enabled with a jaw and a u-shaped connector along-with a bolt connecting the ends of the U. These are also known as jaw and jaw, hook and jaw, or jaw and eye. The jaw portion features a shaft along-with a jaw outside and a threaded shaft inside, which couples with the turnbuckle’s central nut. The jaw end is is ideal for those devices, whose anchor point is fixed and where there is a possibility of the anchor point to slip out of an open hook. These are also known as stub and stub and are made up of two threaded shafts, which couple with the turnbuckle’s central nut. These rivets are used at places, where a connector is not required for an anchor point and in areas, where the turnbuckle is used to push apart objects on either end. 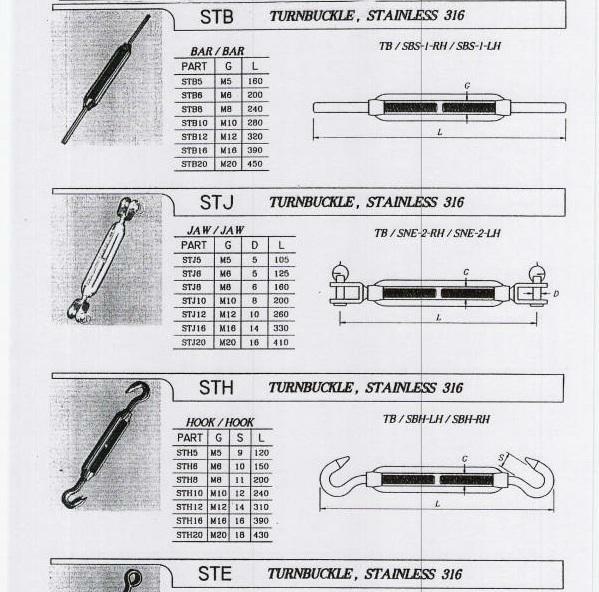 These are the primary types of turnbuckles used in the hardware industry. However, if you go online then you’ll come across various other types as well, suiting every industry requirement. You can visit here to know more about these fasteners. 2. Safety Methods for Turnbucles. I am looking for a turnbuckle 1/4 inch size with jaw type ends with a integrated nut as in welded to the jaw.